Google is updating its Google Play Console to give developers a deeper understanding into their applications. The console will now provide “organic acquisition insights” on how users discover applications. Organic traffic refers to users coming to a store listing through exploring or searching Google Play. Discovery can happen from a seasonal collection, featured app or searching for a specific term, Grinsted explained. Previously, the company bundled all this data together into user behavior. 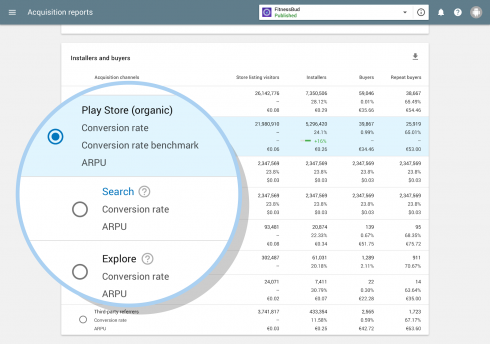 With the latest update to the Play console, Google is breaking down the data into new and exclusive acquisition insights. The new data breakdown will provide information on how many users come to a store listing based on search and exploration and enables developers to click-through the specific search terms people are using to find their store listing. In addition, the new data will include information on when people saw previews of developers’ Play Store listings instead of just when they visited the full page. “This new information gives you more visibility into where people see your assets,” Grinsted wrote. “It helps you decide how to optimize these assets, for instance by ensuring that your screenshots are impactful.